Villa Talos is located on the seashore of Lesvos Island and offers pure luxury in a stunning location for an unforgettable holiday. The Villa has three floors, which are furnished and decorated with great attention to the details. The villa has a total capacity of up to 12 adults and 5 children and is an ideal place for families or groups of friends. On the ground floor there is a spacious living room, which is divided into several separate seating areas. Further more there is a fully equipped kitchen with all necessary equipment for up to 30 people. On the ground floor there are also two separate family apartments: The first contains a kitchenette, a double bedroom with en-suite shower room, a living room and a mezzanine suitable for up to two children, as well as a large balcony with a view to the village of Sigri. The second apartments has a kitchenette, a double bedroom with en-suite bath and shower room, a mezzanine suitable for sleeping up to two children, and a large balcony with an amazing view to the Aegean Sea. On the first floor there is a master bedroom with an ensuite bathroom, fireplace and a large balcony with a cozy seating alternatives while watching the sea. On request, an extra bed for a young child can be placed. Further more there are three double bedrooms with en-suite bathrooms or shower rooms, all with large balconies and all with seaview. There is also another living room to spend time together, to be online, play games, or just enjoy to enjoy the view. On the lower ground floor there is a lounge with a fireplace, another living room with a 42” TV, DVD Player, Music system and home cinema facilities, wich has a spacious wooden floor area for dancing or working out. There is also a bar area with a fridge. The hidden gem of this stylish house is the indoor heated swimming pool of 80 m² with hydro massage, swimming waves, and a sauna. The Villa has a lift to access all floors easily. Coming across the ground floor you have direct access to the garden and the 120 m² outdoor, heated, seawater infinity swimming pool that overlooks the sea. On the patio you can enjoy the morning coffee or just relax and have a drink in the evening. The beautiful orchard and flowers on the property adorn the luxurious villa. 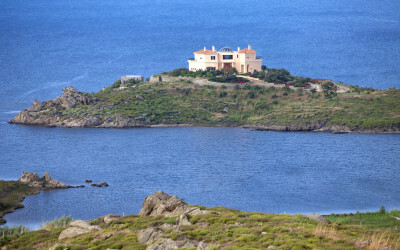 Within reach from Villa Talos there are three private sandy beaches for longer walks. The Villas is surely one of the most stunning places for a luxury villa expreience at Lesvos Island. The Villa is available for minimum stay of 1 week, during the period mentioned in prices. For the rest of the year, prices are upon request and minimum stay 2 weeks. House made available all the day as well as gardener.